Snow has finally made an appearance in New England. The locals are excited. The ski resorts are excited. Cross country skiers are excited. Sledders are excited. Kids who play outdoors, build snowmen or have snowball fights are excited. The snow plow drivers are excited. I don’t do any of those things but I am excited, too. Something about snow is peaceful and calming. The landscape is blanketed in white, sounds are muted, automobile traffic slows and some folks, especially me, simply want to open a book and read while relaxing in a favorite chair, looking up every page or so to watch the snow flakes fall…. and occasionally opening the door to toss seeds, fruit and nuts to the waiting birds and squirrels. I did finish a book and read half of a new book today but when the shadows grew long, I decided to pull on boots and make the first tracks in our landscape. From where the snow depth reached near the top of my boots, I’d guess we were served up about 10-inches of the white stuff…. give or take an inch or so. Winds caused peaks and valleys so it’s hard to be exact. I was thankful to have a thick blanket of snow over most of my smaller plants like my boxwood below. The insulation will help them tonight, tomorrow night, and later this week when temperatures plunge close to zero degrees. When the weather turns this cold and snowy, our birds seem to lose a little of their apprehension of approaching humans…. meaning me. It’s all about survival now. They come often to feed and the heated birdbath proves to be a popular meeting place for all birds and squirrels. With melting snow turning my socks cold and wet inside my boots, I quickly decided all was well in our little world. I made my way back to my reading chair with a hot mug of tea, a nice warm blanket, and dry socks. I will finish another book today. Our garden bench seems to provide us with a pretty accurate snow depth from each winter storm. We haven’t heard the official amount for Exeter but unofficially we received 17″ – 18″ additional snow on top of the last nor’easter. Very beautiful to see at first light but enough….. Where is spring? I know bad things can happen during a major snowstorm but it does give you a boost to look out the window and see a blanket of pure white. We had a break in the snowstorm and decided to go for a short walk on our well-maintained street. 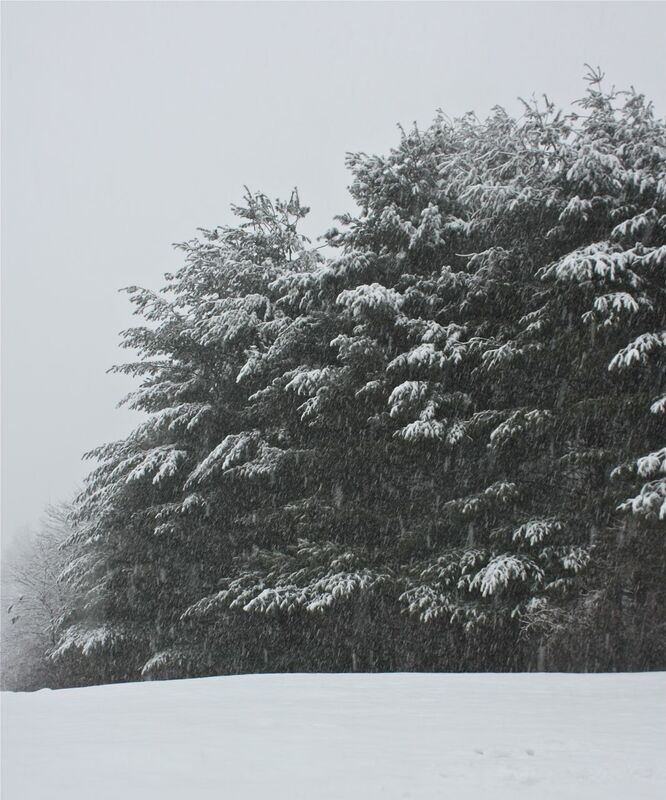 The snow-laden branches of trees, dark against white beneath a heavy gray sky, were impressive. Soon the wind will pick up and that snow will be blown from the trees…. or limbs will fall beneath the weight. If that happens, we will keep our fingers crossed for no property damage, personal injury, or downed power lines! There is nothing more magical than waking to a blanket of snow from an overnight storm. I cracked open the door and listened. There was a sweet quietness as the snow covered every horizontal surface and muted all sound. Snow is still falling this afternoon. Although we’re living in the north where no one seems intimidated by the white stuff, schools were delayed. I imagine kids must still in their pj’s sipping hot chocolate in front of a glowing, warm fire… or either next to the glow of a warm tv. 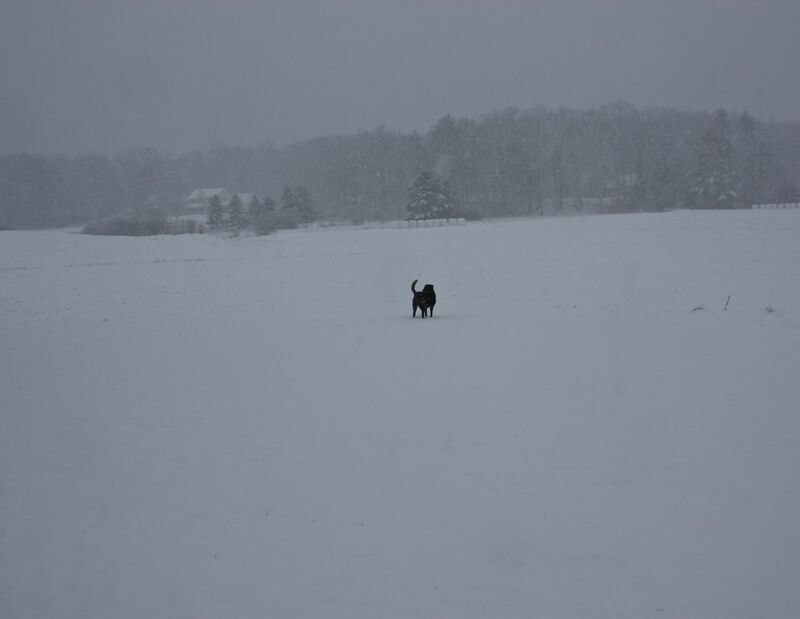 But this ‘kid’ and her dog ventured out into the storm of white. Mattie loves a snowy day. She jumps. She runs. She eats snow. 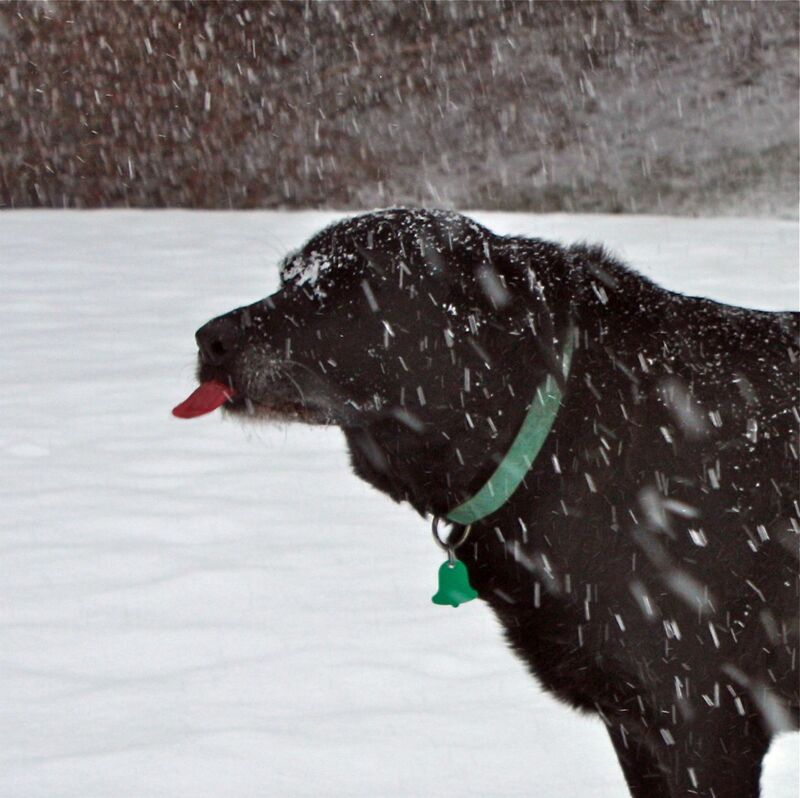 And she catches snowflakes on her tongue. So do I….. We love a snowy day!